"Would you mind if we just skipped to the killing bit?" 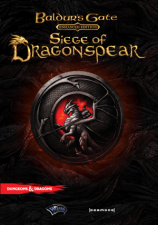 Buy Baldur's Gate: Siege of Dragonspear now! All novel series from the same author are listed either in the order of release, our recommended reading order, or grouped together by theme. Where the novels belong to a series and are not clearly marked as Book 1, Book 2 etc., they are listed in the order of release, or in the order they should be read, from first to last. If the book list in a certain subsection spans more than a single page, the links to the other pages can be found in the subsection menu on the right side of the page, and at the bottom of every page in a subsection. Please check the main Fantasy Books page for detailed ordering information. Spotted a broken item link? Please let us know. Looking for a book or something else that's not listed here? Simply click on the appropriate Amazon button below and search for it.